Hello friends! I hope you're enjoying your holidays in the way that you enjoy them most. Christmas morning at my house was really nice and the rest of the day pretty laid back. That's how I enjoy them the most! As you can see with the photo up above, I'm getting ready for the New Year! My friend is having a little get together for New Year's Eve, so I thought Jamie's 3D Firecracker would make the perfect centerpiece. I know Saturday is the usual tutorial day, but I can't make Jamie's already perfect tutorial on how to make this firecracker any better, so I'm just here with a decoration suggestion. Start with festive papers! I am using holographic paper that I picked up at JoAnn's. If you use this paper, be sure to set you Cameo (or other electronic cutter) at heavy weight so that it double cuts. Then you want to be sure you're using a SUPER strong adhesive. I used Scor-Tape. I then cut numbers from two shades of glitter card stock. I also cut the sparkler pieces at the top from the same two glitter card stock. I have to be honest, the numbers are by Jennifer Wambach and I've had them in my own collection from the Silhouette Online Store. I've asked Jennifer to put these Scalloped Numbers in the store so be on the lookout for them. I think this is going to look great on my friends buffet. You could go a step further, if you don't mind it being taken apart later.... put some goodies inside like noisemakers, candies and for the adults, shot size bottles of favorite liquers. I hope this inspires you to get really festive and creative for your New Year's get together. Let me wish you a very Happy New Year - I hope 2016 holds many blessings and lots of creativity for you! Hello! I was so proud of myself. I got the TMS blog post ready Sunday night because I knew I'd be out late yesterday. But I completely forgot to set up my own post. Silly me! It's that time of year again! It's time TMS' annual Anything Goes challenge. I went with a creative and very easy card design by Carina Gardner. Her designs are available at DigiPlayground. Isn't it cute? It's only a few cuts - it didn't take too much time at all and it went together really easily. Just don't be frugal with the pop dots. I found that middle sort of dipped in towards the base of the card without have dimensional tape there, too. Please join us over at TMS - it'll be tons of fun and I'm building a special box filled with fun papercrafting goodies. Hi! Look at me - two posts in one day. I haven't even had two posts in a week much lately. But I decided I just had to play along with Ellen Hutson's 12 Tags of Christmas with a Feminine Twist 2015 challenge. If you know me, then you've probably heard me share that my nightly ritual before going to sleep is I'll read for a little while and then watch a crafty video. Monday nights it is ALWAYS Hello Monday with Julie Ebersole and most other nights it'll be Jennifer McGuire (and others). I feel like if I go to sleep with these ideas swimming in my head, I will wake up the next day feeling creative. So part of the challenge is to tell which day inspired me the most. It's day 6. Snowflakes!! They're a favorite right up there with my beloved snowman. But I've also been wanting to play with clear shaker cards like Jennifer and Julie did on their blogs. I was lucky enough to have stumbled onto a sale at JoAnn's. All Heidi Swapp things were on sale for 70% off - I scored a fuse tool for under $9!! I need to practice a wee bit more, but I am still pleased with the results. I put a strip of glitter tape in the bottom portion of the pocket and sealed it in. Then I took a piece of Neenah Solar white card stock and lightly inked the edges with Tumbled Glass ink and also stamped a few snowflakes with the same ink. I stamped a couple of the snowflakes in Broken China. I added a few snowflake sequins on top of that and sealed it up. Then my top portion I filled with sequins and beads. I finished off my tag with some pretty silver metallic ribbon and some pool colored seam binding. The bow is from some pretty silver/gray satin ribbon. That's it - it'll dress up my younger son's Christmas gift to my daughter. Good Morning! The last sketch of the year is posted on TMS blog. It's another great one by Nina. I love the blocking! This worked great with my idea for this week's card. Our sponsor is DRS Designs. I am featuring their stamps for the fun, whimsical card. Isn't this a fun card? The colors just scream Christmas cheer! It's also a simple coloring job. 2 shades of red and 3 shades of cool gray Copics. The paper is from a 6 x 6 paper pad by AC called Christmas. I then covered the bells with crystal glaze and then sprinkled a bit of glitter on the wet glue. Easy card and it's a single postage stamp. Please head on over the TMS blog to join us! Hi friends! Nina's sketch is up at TMS and DT member Kris is sponsoring. She's giving away one fantastic prize!! Today's card features oldies but goodies. The paper has been in my stash for a couple of years now. It's actually Echo Park paper, but I purchased it from Sweet n Sassy. The stamps/dies are from one of my favorite Christmas sets ever called Warmest Wishes by There She Goes Stamps. Jessica hasn't been in business for what 2 or 3 years now? But the set was designed by Torico and she has a stamp line at MFT Stamps. I created a quick winter scene - yes, I could have done a lot more to this scene, but I wanted this one quick and simple. I love it! The papers, as I said, are from a paper pack that I've had for a long time. Most of them scraps. I added the sentiment - which is actually glitter washi tape that I got at Michaels for half off and then I finished it with a star sequins and itty bitty teeny tiny star sequins on the trees and snowman. Please join us at the TMS blog - you'll love what the girls created to share with you, too. Thank you for stopping by. And be sure to drop by Wednesday for Day of 2 of my ornaments share. Hello friends! 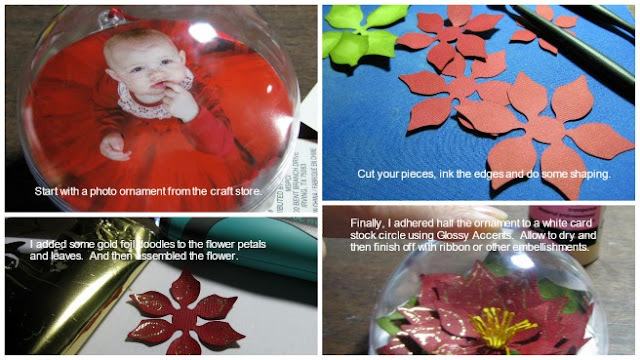 I have a super easy tutorial for a beautiful ornament idea. My ornament features the gorgeous poinsettia from Jamie's 3D Poinsettia Wreath. This is day one of my 5 days of ornaments series that I'll be doing here on my blog. I hope you come back everyday! I wish I knew how to remove the glare so you can see just how pretty this is without my reflection in the photo! Here's a quick tutorial - just click on the picture for a larger view. But I started with a photograph ornament that I picked up at Michaels (with a 50% off coupon). This is great, too, because you can make two from one ornament. Then you cut out pieces for the flower. I inked up the edges with various Distress Inks colors and then use my shaper tools to shape the petals and leaves. Using my WRMK Heatwave tool, I added some gold foil doodles. I wasn't looking for anything more than just adding touches of gold. Then I built the flower. I cut a circle of white card stock that was 3 1/4" which is a hair bigger than the ornament. I used Glossy Accents to adhere the ornament to the backing and then weighted it down with some acrylic blocks. After it was dry, I added ribbon around it and a bow. Easy! I hope this inspires you to create fun ornaments for your tree or to give as a gift. Thank you for stopping by. I'll be back again tomorrow with another pretty ornament to share!